Clarke, E. V., Benoit, M. E. and Tenner, A. J. (2013). Purification of Human Monocytes and Lymphocyte Populations by Counter Current Elutriation – A Short Protocol. Bio-protocol 3(23): e981. DOI: 10.21769/BioProtoc.981. Investigations of the activation processes involved in human monocytes and monocyte-derived macrophages and dendritic cells often required large numbers of cells that have not been possibly altered or activated by adherence to surfaces, by binding of antibodies to surface antigens during positive selection, or by release of activators by platelets or other non myeloid cells during isolation or co-culture. Human peripheral blood monocytes as well as lymphocytes from the same blood donor can be isolated by counterflow elutriation using a modification of the technique of Lionetti et al. (1980) as described previously (Bobak et al., 1986). From a unit of blood drawn into anticoagulant, 60-120 million monocytes can be obtained. These cells are not activated and have been shown to be appropriately capable of differential activation in multiple studies. ** Beckman Coulter has newer models Avanti J-301 or J-26S XP with Elutriation Systems, but we have no experience with those. Using an RC-3B Centrifuge, spin a 450 ml bag of blood upright with no brake, 25 °C, 1,665 x g, for 7 min. Takes approximately 30 min to come to a stop without the brake. See Beckman JE6B Elutriation System and Rotor Assembly Manual. Spin elutriator rotor by hand for 30 sec to remove air pockets. Finally, equilibrate tubing and chamber with elutriation buffer (with 100-200 ml approximately 11-12 ml/min.flow rate). Sit blood bag on extruder carefully and place onto the hooks on extruder. Wipe tube of blood bag and scissors with alcohol wipes to sterilize. Wipe tubing end with alcohol, attach clamp, and insert into a 250 ml plasma tube (if collecting plasma for later use) or waste (if not collecting plasma). With clamp shut on tubing, release press to squeeze bag gently. Open clamp to control flow to a fast drip/slow stream. Stop plasma collection when plasma is approximately 1 inch from top of bag. Transfer blood bag tube to T75 flask containing 50 ml PBS 0.02 mM EDTA, where you will collect approximately 25 ml plasma and 20 ml erythrocytes plus white cells) often called the buffy coat. Swirl flask gently. Total volume in flask should be approximately 90-100 ml. Tilt 50 ml tube containing 14-18 ml LSM and using a 10 ml pipette, layer approximately 30 ml buffy coat-PBS-EDTA carefully from flask onto LSM, repeat with second and third LSM tube. Remainder of buffy coat-PBS-EDTA should be layered onto last LSM tube. Balance LSM tubes, spin in RT6000 at 350 x g for 40 min, 22 °C with brake off. Remove diluted Plasma from top of tubes of LSM (approximately 25 ml). 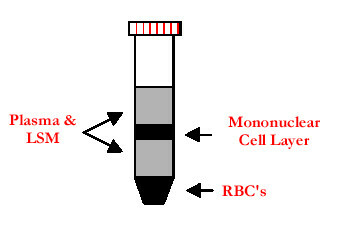 Remove peripheral blood mononuclear cells (PMBC) interfaces, add to 40 ml PBS/1 mM EDTA in 50 ml tubes and invert to mix. Spin in RT6000 to remove platelets, 200 x g for 10 min. Pellet should be visible. Pour off most of the supernatant. Resuspend all pellets, pooling in a total of 8–10 ml elutriation buffer. Avoid air bubbles. Count PBMCs: should be between 7 x 108 and 1.5 x 109 total cells depending on the donor. Run some elutriation buffer through to equilibrate (100 ml). Spin rotor manually for approximately 30 sec to remove air pockets. Close lid and allow speed to get up to 1,450 x g (final speed) before checking flow rate: should be between 11.4 and 11.6 ml/min. Transfer pipette attached to pump tubing into cells and pump full volume of cells (8-10 ml) before transferring pipette back to elutriation buffer. Avoid taking up any air by pinching tubing during transfer. Collect the effluent. Collect the first two 50 ml tubes of effluent which will contain the lymphocyte population (with some contaminating platelets and red cells) and spin down at 100 x g to remove platelets. Lyse any remaining erythrocytes in ACK at room temperature (by resuspending the pellet in the ACK and gently inverting the tube 1-2 times), wash the lymphocytes once in HBSS by resuspending in 25 ml, count cell concentration, pellet cells again at 100 x g, and resuspend the lymphocytes in complete media containing 50 U/ml IL-2 at 2 million/ml in complete media in T75 flasks. Monocytes will remain in chamber, due to size and density and centrifugation conditions. After 35 min run at 11.5 ml/min increase speed to 12.5 ml per min. Continue to run for 25 min (total runtime is 60 min). Clamp output and input tubes before pump is turned off, then immediately stop centrifuge. Open lid and unlock black lock, then remove input tube first, then lower outlet tube. Remove elute chamber, with spout up. In hood, using a P1000 remove the 6.3 ml of sample from the elutriation chamber and add to 50 ml tube. Bring up volume up to 20 ml with 1x PBS. Count cells. Monocytes should be approximately 10-20% of original PBMC count. Wash cell pellet with sterile PBS. 200 x g for 10 min. Resuspend pellet to 100 x 106 cells/ml. Plate monocytes in 10 cm petri dishes at 0.5 x 10 E6/ml (10 ml total/dish) in complete media containing 25 ng/ml M-CSF for derivation into macrophages. Place elute chamber back into rotor and rotor back into centrifuge chamber attaching tubes to wash out/decontaminate rotor, tubing and chamber. Undo clamps and run through 300 ml 10% bleach, 300 ml autoclaved H2O, 300 ml 70% EtOH, 300 ml water again. Disassemble rotor, set in 70% ethanol for 30% and let air dry overnight. Fliter sterilize (Using Stericup) and store at 4 °C. Dissolve and bring to final volume of 2000 ml with MilliQ (LPS-free) water. Filter sterilize. Diluted at room temperature should be pH 7.0-7.2, and K = 14-16. Store at 4 °C. The original protocol was published in Bobak et al. (1986). Further modification and development of these methods was supported in part by NIH AI-41090 and T32 AI 60573. Bobak, D. A., Frank, M. M. and Tenner, A. J. (1986). Characterization of C1q receptor expression on human phagocytic cells: effects of PDBu and fMLP. J Immunol 136(12): 4604-4610. Lionetti, F., Hunt, S. and Valeri, C. (1980). Methods of cell separation. Plenum Publishing Corporation, New York. How to cite: Clarke, E. V., Benoit, M. E. and Tenner, A. J. (2013). Purification of Human Monocytes and Lymphocyte Populations by Counter Current Elutriation – A Short Protocol. Bio-protocol 3(23): e981. DOI: 10.21769/BioProtoc.981.